Our services provide participants with the skills necessary to manage stress and pain, as well as improve their appearance and sense of well being. Research has proven that relaxation techniques, meditation and massage therapy help people to experience a healthier lifestyle, retain functional independence and expand their quality of life. Starfish have the ability to heal and regenerate any part of their body. They symbolize the resilient capacity in the natural world to grow and evolve in challenging situations. Our services do not replace, but rather supplement, traditional medical treatments and therapies. We employ only complementary health techniques and methods which use the senses of touch, smell, hearing, taste, and sight to help participants experience feelings of relaxation, happiness, warmth, and safety - the basic feelings essential to a fulfilling life. Gloria, a nationally certified massage therapist, reflexologist and oncology massage practitioner, holds a Master of Education and Master of Management from Cambridge College in Cambridge, MA. Gloria also holds licenses for Cosmetology and Aesthetics in the states of Massachusetts and Florida and is trained in Thai massage, meditation, chakra balance, aromatherapy, energy work and yoga. 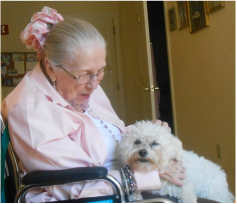 Our 10 year old Bichon Frise is a certified therapy dog who provokes a smile in everyone he sees. Copito (Snow ball), is hypo-allergenic and is available during all services at the request and/or approval of the facilities we work with. He does not only bring joy to our senior clients, but also to all pet lovers. Dogs have been proven to reduce stress and anxiety along with having many other health benefits. Alba, a Licensed Massage Therapist and Certified Nursing Assistant. She is Home Care Assistant and Certified Physical Therapy Aide. She is Certified in Reflexology and Hospice Care. She holds a Bachelor's Degree in Economics and has been working for over 10 years with the special needs populations and geriatric patients. Dulce has a Certificate of Advanced Graduate Studies and a M.A. in Mental Health Counseling. She has been providing group and individual therapy for the past four years. Her specialty is in working with the Latino population with a special interest in positive psychology. John is a Licensed Massage Therapist and graduate of Cortiva Institute of Massage Therapy. Luis is a Licensed Massage Therapist, Certified Nursing Assistant and Physical Therapy Aide with extensive experience working with the elderly and handicapped. He has completed courses by AMTA in Meeting the Needs of Elderly Clients and Massage for Active Seniors. Maura has an M.A. in Behavioral Sciences/Human Behavior and is a Licensed Mental Health Counselor. A creative agent for change, she has supervisory, managerial and direct care experience in the fields of: Mental Health, Education and Healthcare. An advocate for high risk and multi-cultural populations for over twenty years, she works to spread joy and hope to these populations. Priscilla is a certified nutritionist and reflexologist. She started as a PBL client and now is part of our team serving other seniors. Akila is a Licensed Massage Therapist, an Oncology Massage Practitioner and Certified Reflexologist. She has a Degree in Social Sciences. A Staff Massage Therapist at Boston Medical Center, she has a Certificate in Tai Chi for Arthritis patients from the Arthritis Association as well as training in Raindrop Therapy, Chair Massage, Qi Qong and Qi Healing and is currently studying Shiatsu Massage. Master on Public Health and Nationally Certified Massage Therapist and Hawaiian Therapeutic Massage practitioner. Kathleen, a pastoral counselor and nationally certified massage therapist, drug and alcohol counselor for over 30 years, holds a BS degree from Regis College in Weston, MA, a Master of Religious Education and a Master of Pastoral Counseling from Emmanuel College in Boston, MA. Kathleen facilitates reflexology and yoga for the sick and elderly in assisted living facilities and nursing homes and specializes in Twelve-Step Spirituality retreats throughout New England. Rosita graduated from the Catherine Hinds Institute as a Master Esthetician and is an experienced Reflexologist. With certifications in aromatherapy, chemical peels and laser hair reduction, she has worked with the elderly in adult day care programs as well as in private spa settings. Joanne is a Licensed Massage Therapist.